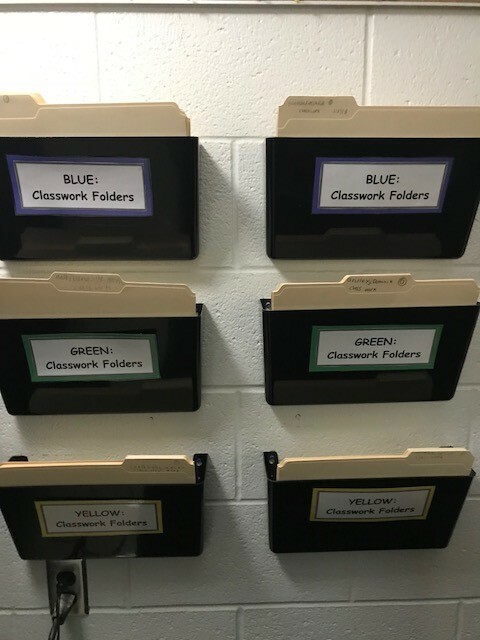 On this page, you will find how students stay organized within my classroom. We took many days to set up our organizational strategies, so the environment is less chaotic and more writing friendly. The explanations for each picture appear below it. Writing Process and Writing Traits Bulletin Board used for a resource in the room. 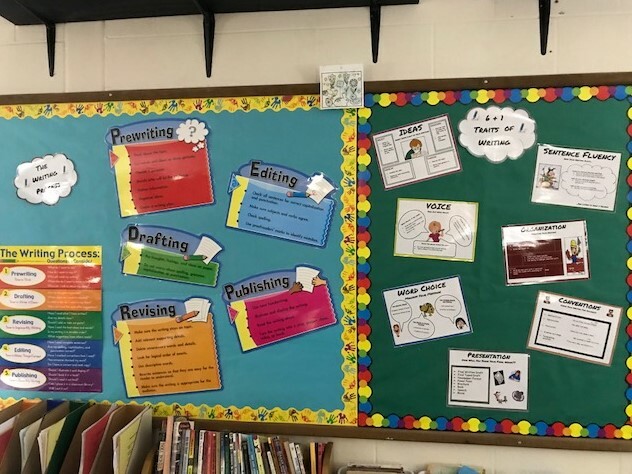 Types of Writing Bulletin Board used for a resource in the room. 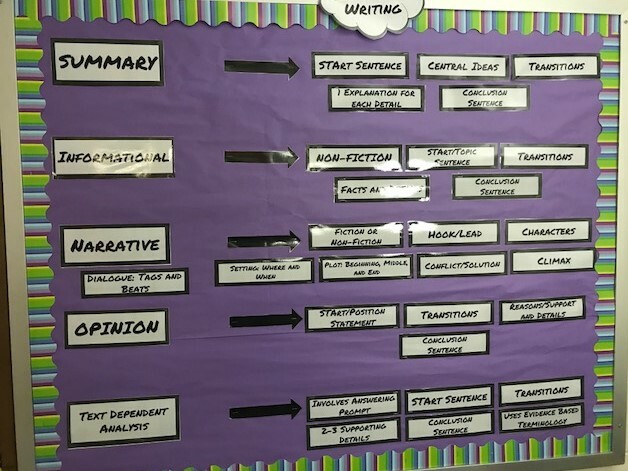 This Non-Negotiable board is used for students to see specific skills that are REQUIRED in all writing. 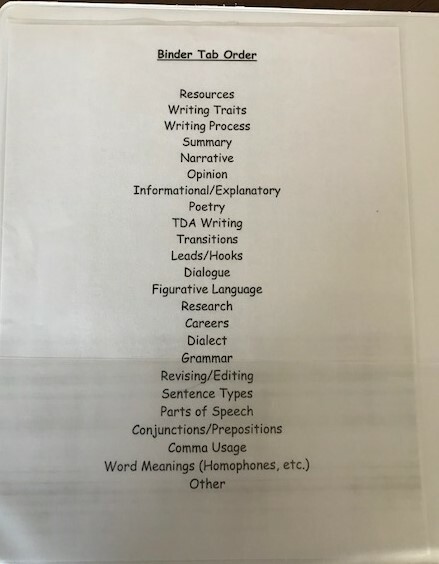 For each missed skill in a specific writing piece, I take off 1 point up to 5 points for each skill. As the year progresses, so does the board. This is another resource for students to improve their writing. 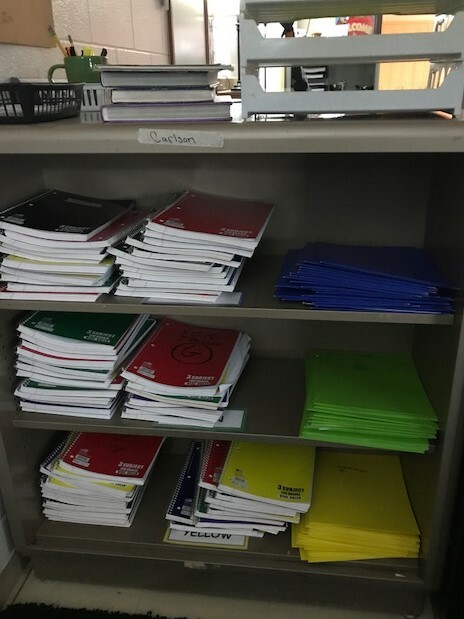 Each class has their own shelf for writing notebook and folders. The notebooks are used for notes, prewriting, and On Demand Writing. In the front, students provide a heading for each page depending on the lesson, and students copy notes from anchor charts or other in class devices and complete prewriting activities for given assignments. In the back, students complete On Demand Writing and personal scoring based on a rubric. The folders are used for additional paperwork needed as a resource. The black file cabinet houses the students writing portfolio. 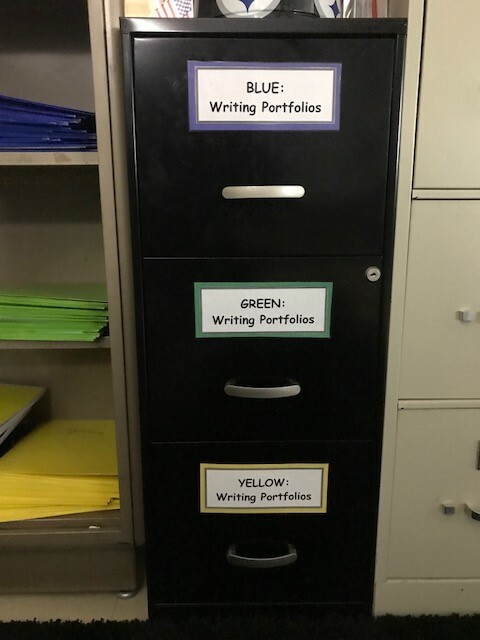 Each class has a cabinet to store their portfolios. Within the portfolio, students have two folders and writing assignments. One folder is a resource folder. In this folder, the students keep resources given for particular writing skills learned. They also have their resource packet chalked full of all the topics we cover in writing. 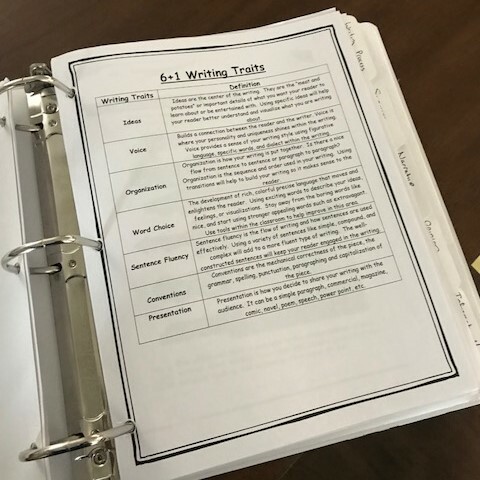 In the other folder, students log their writing assignments and keep track of positive remarks and skill improvements from the teacher's comments on finished assignments or conferences. 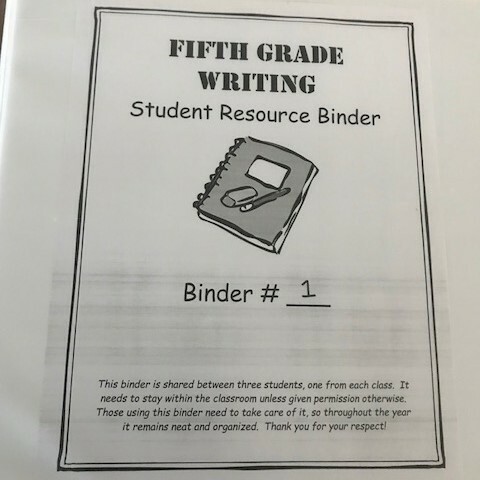 Each student is assigned a binder filled with information and resources about all the skills and topics covered throughout the year in class. This binder serves as a "Writing Textbook" for each student. Because I have three classes, three students are assigned to one binder (one from each class). More pictures of the binders; the cover, all the tabs within the binder, and an example page. These organizational trays are used for Classwork Folders. In the Classwork Folders, students keep current writing projects or assignments. The folders stay in the room, so the students always have their current work available. Once we are finished with the assignment, students put their writing in their writing portfolios. 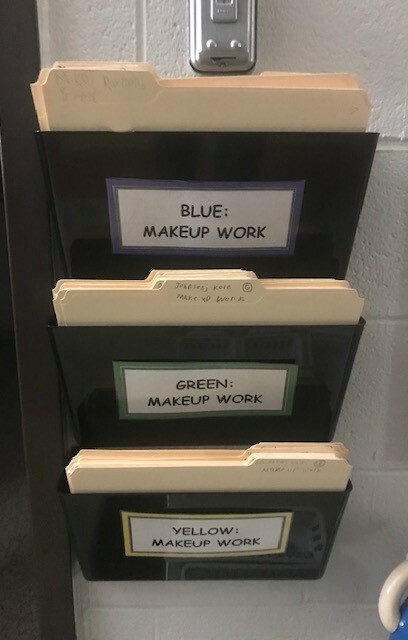 These trays are used to hold Makeup Work folders. When a student is absent, the work they missed go into this folder. Also, present students will write a note and put it in the folder to the absent student. Once students come back to school, they check their folder for the work they need to make up. 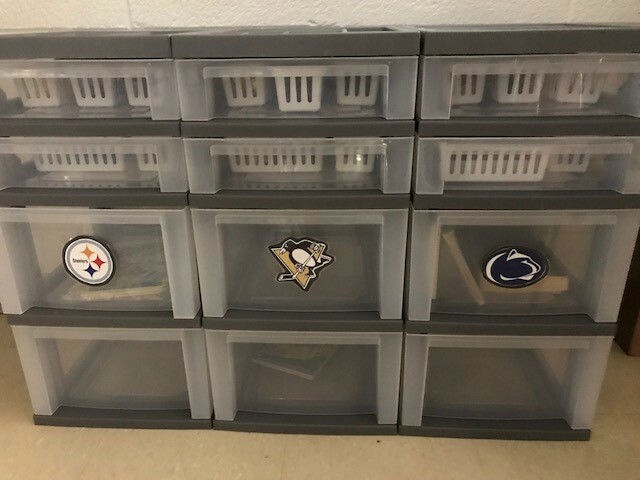 Throughout the room, there are five of these bins organized by teams; Steelers, Penguins, Penn State, Duke, and Pirates. Students in Fifth Grade are broken up into these teams. In the bins are pencils, highlighters, index cards, whiteboard markers, erasers, and Post-It notes. Only students located in each particular group can use the supplies in their bins. 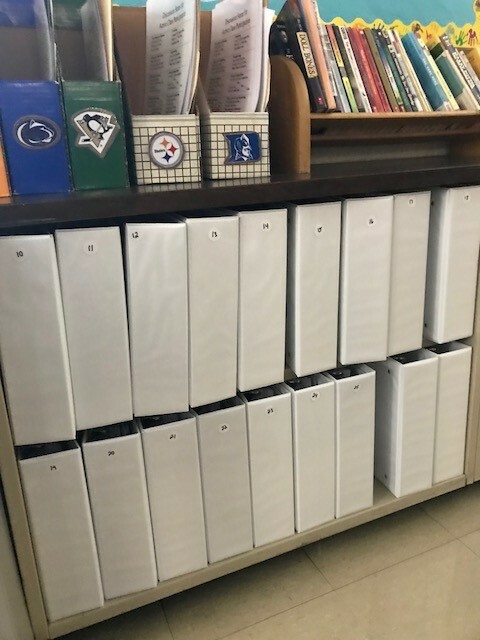 Then my homeroom students or Core students can use the bottom two drawers for agendas, homework folders, or chapter books. These white bins hold clipboards for students. There are five bins, one for each team, with ten clipboards in each bin. 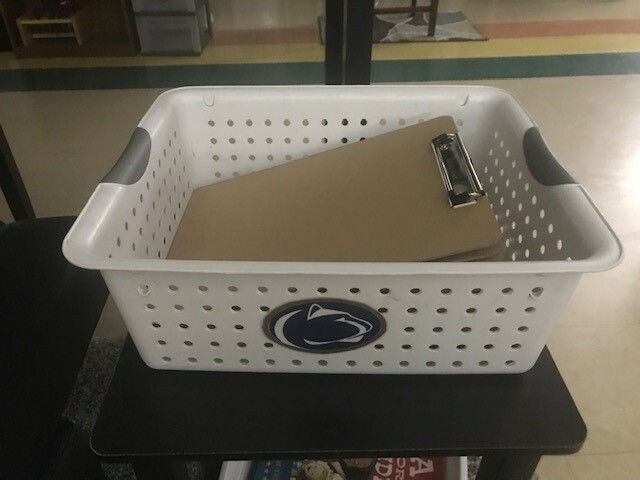 If needed, students in each team can use clipboards from their particular bin. 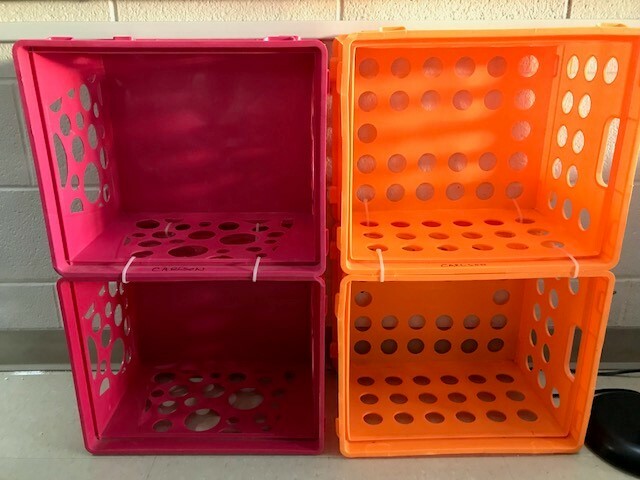 I have six crates in my room for students to put "extra" materials when they come into class. "Extra" materials may be math books, ELA binders, chapter books, etc. It is a place to keep materials out of the way but organized. 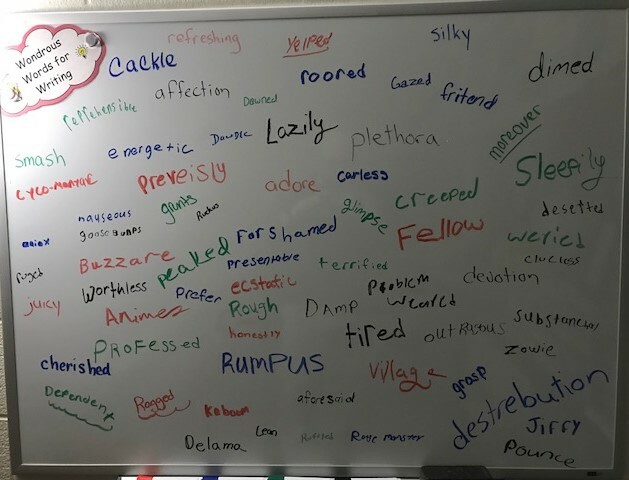 This is the "Wondrous Words for Writing" board. When students read or write a word they feel is "Wondrous", they write it on the board. As you may notice, some words are spelled incorrectly. This is part of the process. Eventually, students will need to go back and fix spelling errors. 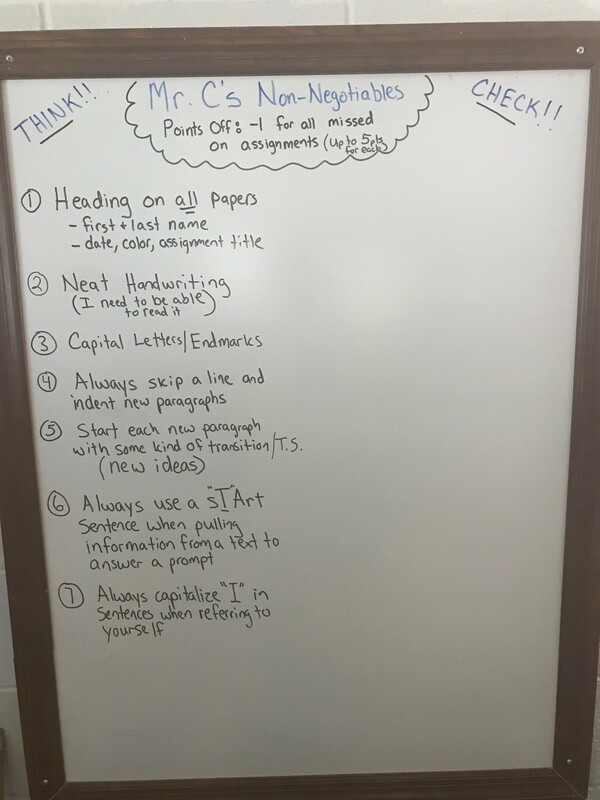 The board is then used for student writing. It is a quick resource for the students to make their writing more exciting.